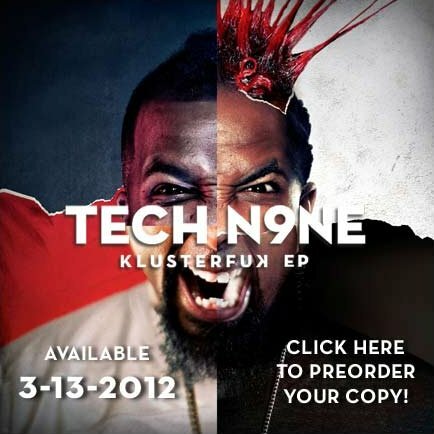 Tech N9ne – Klusterfuk EP Pre-Order Now Available! Strange Music is kicking off 2012 right with Klusterfuk, the new EP from Tech N9ne. With production by Plex Luthor, Gianni Ca$h and Wrekonize of Mayday, along with features from Krizz Kaliko, Wrekonize and more, Klusterfuk will definitely get fans amped up for the Hostile Takeover 2012 Tour! Don’t miss your chance to experience the chaos that makes Tech N9ne a Klusterfuk. Pre-order yours now at strangemusicinc.net – you’ll get a signed copy of Klusterfuk, a Strange Music Snake and Bat decal and a preview track from the EP, “Blur”! Head on over to strangemusicinc.net and preorder your copy today! Head on over to strangemusicinc.net and preorder your copy today!